Micro-Epsilon: In wind turbines, the bearing gap is very important because the better the sliding properties, the higher the plant effectiveness and service life. The bearing gap between the bearing surface and the drive shaft is reliably monitored using inductive sensors from Micro-Epsilon based on eddy currents. 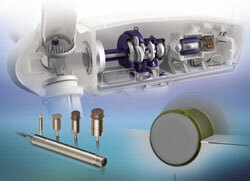 Wind turbines typically have two main bearings in which the rotor shaft runs. Due to safety and cost reasons, wind turbines require 24/7 monitoring. Determining the bearing gap is one of the most essential tasks in wind turbines, as the bearing gap provides information about the sliding properties. If the gap width is reduced, the oil film is also reduced, which should protect the bearing components from friction-induced wear. In the worst case scenario, reduced sliding properties cause contact between the components, which causes increased friction that results in an increase in temperature inside the bearing. Consequently, the components wear much faster, which could lead to bearing damage. To date, bearing gaps were measured during standstill based on a tactile principle. This meant that long inspection intervals were required in order to operate the plant for as long as possible without having to shut it down completely. However, the risk of a plant failure arose. In contrast, inductive sensors from Micro-Epsilon are based on eddy currents which enable reliable, fast and cost-effective bearing gap measurements. It is not necessary to shut down the plant as measurements are carried out during operation. Since the eddyNCDT 3005 measuring system withstands oil and bearing-typical oil pressures up to 2 bar, it is ideally suited to measurement tasks in harsh environments. The system includes a sensor with a measuring range up to 6 mm, which is permanently connected to the controller via a 1 m long cable. It enables the optimization and analysis of the maintenance intervals. The analog signals are output and can be directly fed into a PLC. Furthermore, the measured results can be evaluated via external software. Special features such as linearity calibration and temperature compensation from Micro-Epsilon enable the sensors to be adapted to suit different installation positions.